“Game of Thrones” star Kit Harington stars alongside Adewale Akinnuoye-Agbaje in the movie “Pompeii.” Harington plays a gladiator named Milo, who has to try to save himself and others from the destructive eruption of Mount Vesuvius. Photo courtesy of Caitlin Cronenberg. Hollywood has a particular fondness for making movies about ancient Rome and Greece. The stories of Roman generals and statesmen, such as Julius Caesar and gladiator-turned-slave-leader Spartacus, have undergone various iterations over the decades in both cinema and television. It was only a matter of time before a film about the ancient Roman city of Pompeii was envisioned to show the time period that led up to the infamous eruption of Mount Vesuvius. But the movie “Pompeii” doesn’t begin in the city itself. We are first taken to Britannia (present-day England) in the prologue, where the Roman army, led by Gen. Corvis (Kiefer Sutherland), butchers a Celtic horse tribe, leaving an infant child orphaned. The boy is enslaved, and we are reintroduced to him years later in Londinium (present-day London), where he has become a gladiator named Milo, played by “Game of Thrones” star Kit Harington. His prowess in fighting is spotted quickly by the Roman aristocrats stationed there, and he’s transported, along with other gladiators, to Pompeii, where his skills can be put to better use. Once Milo enters Pompeii, there’s an overwhelming amount of activity that takes place. First, there’s the reason for his arrival in Pompeii: to fight in the gladiators’ arena. 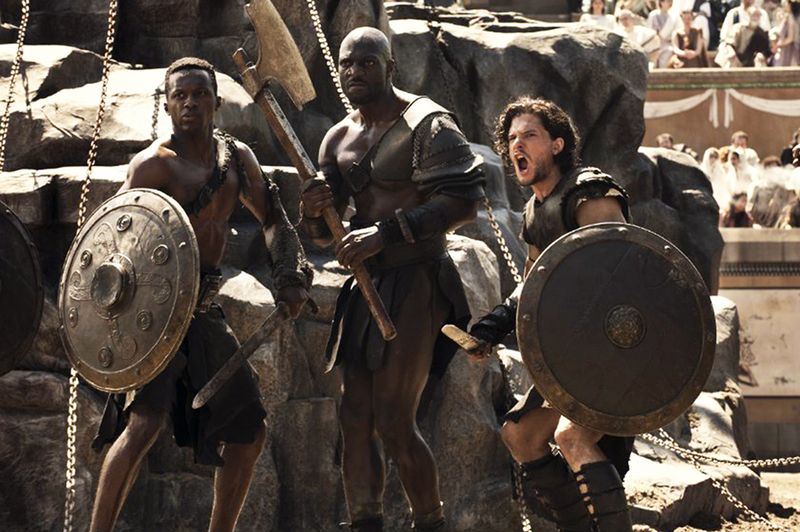 Here, we are introduced to Atticus (Adewale Akinnuoye-Agbaje), an African slave-turned-gladiator whose relationship with Milo takes plenty of twists and turns, both within and outside the arena. Then there’s Emily Browning’s role as Cassia, an aristocrat’s daughter, thrown into Milo’s path with the definite intention of creating some sparks. To complicate matters a bit further, Corvis, now a senator after his victories in England, decides to show up in the city to discuss politics with Cassia’s father, Lucretius (Jared Harris of “Mad Men”). From the get-go it becomes clear that Corvis, too, will have his own face time with Milo. From what little is said here, it’s clear that the movie has several competing plots and themes. One recurring theme that is clear from the onset of “Pompeii” is that of revenge, with Milo seeking retribution from Corvis for slaughtering his family. Then there’s the competing romantic component of the movie that develops unexpectedly into a love triangle. Add to that the gladiatorial elements and you have the movie being stretched in different directions. And we mustn’t forget the volcano. Vesuvius, with all that goes on, gets relegated to being merely a background prop, with the occasional earth tremor grabbing the attention of the audience and the actors until the very end. It’s hard to pinpoint the focus of the movie, and it feels as if each storyline pulls the movie in a different direction. The inclusion of gladiators in the movie merely seems to be an act of embellishment required to draw the younger demographic to the theaters, rather than a necessity to the plot. Even here, the desired audience may not be greatly interested, since nothing exceptional or ground breaking is brought in when compared with the likes of Ridley Scott’s “Gladiator” or TV’s recent “Spartacus” series. The PG-13 rating of the movie reaffirms this, as it restricts the use of weapons and the like so as not to draw the ire of parents. In concise terms, the fight sequences won’t blow your mind. Despite all of this, the movie doesn’t flop by any means. The contending storylines are suitably converged in the finale while Vesuvius rains hell all over the place. The emphasis becomes rather obvious towards the end, where everyone, lovers included, attempts to escape the wrath of the volcano. There are some unintended moments of hilarity here and there, especially in seeing certain characters try to outrun the eruption’s pyroclastic flow on horseback, but these are far and few between. The movie’s use of 3-D is most evident in the arena’s fight scenes as battle axes and spears whiz past the audience’s faces. However, that would cap the 3-D highlights. Nothing exemplary takes place with regard to cinematic use of the technology and this is quite a disappointment, especially since the volcano’s eruption and the like could have been invigorated through the use of an added dimension. Director Paul W.S. Anderson’s experience with filming the “Resident Evil” franchise in 3-D should have given him the opportunity to surpass his previous efforts, but it was not so. Just save yourself some money by refraining from the 3-D screening. “Pompeii” tries to place its feet in several categories by combining a variety of plot lines. The genre could be action, adventure or even romance. Ultimately, this manages to create mixed results. “Pompeii” isn’t a complete disaster, but it isn’t a triumph either. “Pompeii” is out in cinemas Feb. 21.